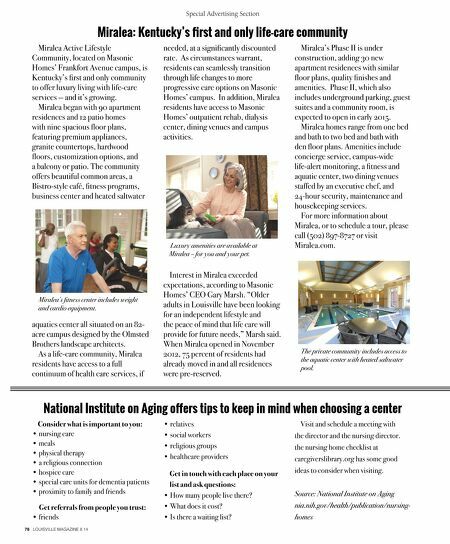 78 LOUISVILLE MAGAZINE 8.14 Special Advertising Section Miralea Active Lifestyle Community, located on Masonic HomesÕ Frankfort Avenue campus, is Kentucky's frst and only community to offer luxury living with life-care services Ñ and itÕs growing. Miralea began with 90 apartment residences and 12 patio homes with nine spacious foor plans, featuring premium appliances, granite countertops, hardwood foors, customization options, and a balcony or patio. The community offers beautiful common areas, a Bistro-style café, ftness programs, business center and heated saltwater aquatics center all situated on an 82- acre campus designed by the Olmsted Brothers landscape architects. As a life-care community, Miralea residents have access to a full continuum of health care services, if Miralea: Kentucky's frst and only life-care community needed, at a signifcantly discounted rate. As circumstances warrant, residents can seamlessly transition through life changes to more progressive care options on Masonic HomesÕ campus. In addition, Miralea residents have access to Masonic HomesÕ outpatient rehab, dialysis center, dining venues and campus activities. Interest in Miralea exceeded expectations, according to Masonic HomesÕ CEO Gary Marsh. ÒOlder adults in Louisville have been looking for an independent lifestyle and the peace of mind that life care will provide for future needs,Ó Marsh said. When Miralea opened in November 2012, 75 percent of residents had already moved in and all residences were pre-reserved. MiraleaÕs Phase II is under construction, adding 30 new apartment residences with similar foor plans, quality fnishes and amenities. Phase II, which also includes underground parking, guest suites and a community room, is expected to open in early 2015. Miralea homes range from one bed and bath to two bed and bath with den foor plans. Amenities include concierge service, campus-wide life-alert monitoring, a ftness and aquatic center, two dining venues staffed by an executive chef, and 24-hour security, maintenance and housekeeping services. 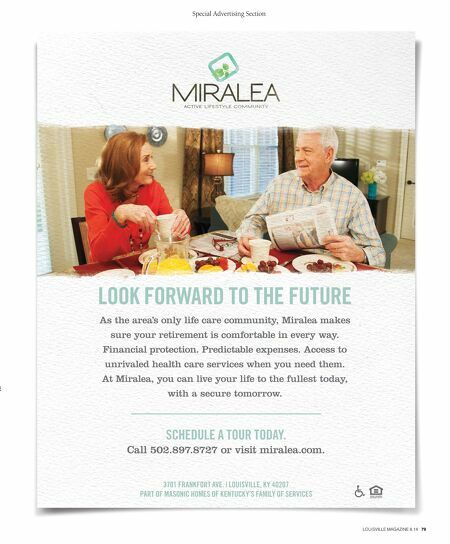 For more information about Miralea, or to schedule a tour, please call (502) 897-8727 or visit Miralea.com. Consider what is important to you: • nursing care • meals • physical therapy • a religious connection • hospice care • special care units for dementia patients • proximity to family and friends Get referrals from people you trust: • friends National Institute on Aging ofers tips to keep in mind when choosing a center • relatives • social workers • religious groups • healthcare providers Get in touch with each place on your list and ask questions: • How many people live there? • What does it cost? • Is there a waiting list? Visit and schedule a meeting with the director and the nursing director. the nursing home checklist at caregiverslibrary.org has some good ideas to consider when visiting. Source: National Institute on Aging nia.nih.gov/health/publication/nursing- homes Miralea's ftness center includes weight and cardio equipment. Luxury amenities are available at Miralea – for you and your pet. The private community includes access to the aquatic center with heated saltwater pool.